This is what the retail stores are meant to be for. Jonathan Phillips, Communications and e-Commerce Manager said having a brick and mortar location for workforce development in Portsmouth is the result of people donating to the local Goodwill as well as customers buying the products which have been donated. 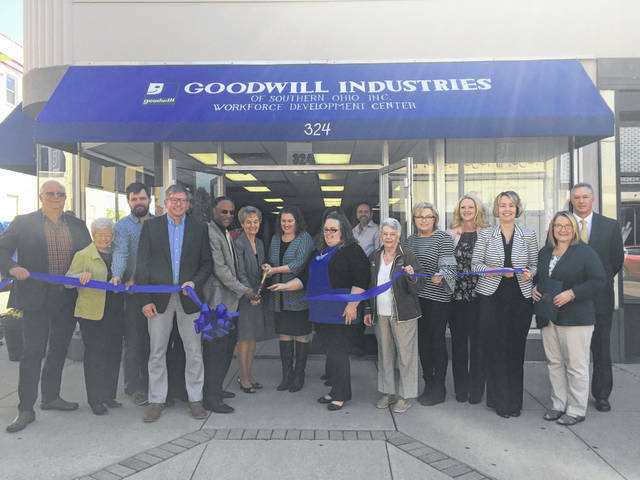 Goodwill Industries of Southern Ohio, Inc., held a ribbon cutting Tuesday morning with about 40 fellow Chamber of Commerce members present to officially open the Workforce Development Center at 324 Chillicothe St. Portsmouth. The new office is designed to get individuals ready for employment, according to Christina Montgomery, Vocational Rehabilitation Manager for Goodwill. She said they will help with everything from creating an attractive resume to how to dress for an interview with a local company. She said they currently have 37 local people who are looking for work, saying they need local businesses to partner with Goodwill and help these people get to work. Lenore Mason, Executive Director, CEO of Goodwill spoke saying the intent of Workforce Development is a “hand up” instead of a “hand out.” She said the program gives a person stability, dignity and purpose. She said the purpose of Goodwill is to help people with disabilities and disadvantaged. Phillips also noted they are currently looking for additional vocational rehabilitation specialists at the center.